Frozen's Idina Menzel Is Over Perfectionism. You Should Be Too. If you have ever fought against the negative aspects of perfectionism in your work life—you'll appreciate the drama surrounding Idina Menzel's New Year's Eve performance of "Let it Go,” from the hit movie Frozen. (Yes, she did miss a key note or two. So what?) We've all given a less than stellar speech or presentation—or missed the mark during an interview—as mistakes happen to all of us. But how we react to missing our "high note" is key. What did you say to yourself? Were you kind and forgiving—or cold and cruel? Did you lose the battle with the notion that you need to be perfect? I applaud Ms. Menzel's attitude toward performing, as she protects what is ultimately important in her career. Perfectionism can begin to wreak havoc in our work lives—if we let it. When our own doubts and lofty standards begin to get in our way (or even debilitate us), we need to fight that insidious tendency to focus on our missteps. We become reluctant to share our work. Often, we feel our work has to be perfected before others see it. (This can pose a real problem if creativity is integral to your role.) Interestingly, the experts at Pixar encourage their employees to share ideas much earlier in the creative process—before an idea is fully formed. The result: The team can collaborate, improve and combine fledgling ideas. We become overly risk-averse. You would know best, if perfectionism is getting in the way—and avoiding anything remotely risky is clear sign of a problem. If you've not stretched yourself or the limits of your work for fear of any mistake or exposed weakness, take note. Certain situations send us into a tailspin. Often we have certain trigger situations that can stoke perfectionistic tendencies. If you avoid certain types of projects or activities, simply because you fear being evaluated, it's time explore the issue head on. Attempt to overcome your initial hesitation. We procrastinate when we face a challenge. We often put things off—solely because we envision failure, not success. As a result, we fail to commit to any idea or direction and remain stuck in neutral. Unfortunately, this can become a powerful stumbling block long-term. Of course, certain professions require precision—and all require our utmost attention. But, forging progress often involves pushing the envelope in some way—our equivalent of singing live, outdoors, in the cold. 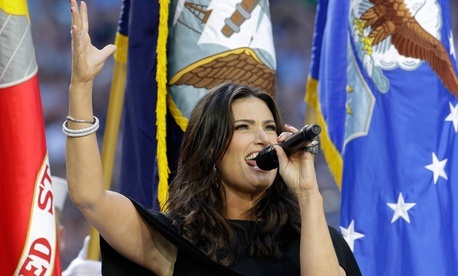 Offer yourself permission to be human and allow an occasional mistake, just as Idina Menzel has done. It could be a winning strategy for you. Marla Gottschalk, an industrial/organizational psychologist, is the director of Thought Leadership at Kilberry Leadership Advisors, Toronto/NewYork. Next Post | Standing Desks Are Good, But Would a Standing Office Be Even Better?